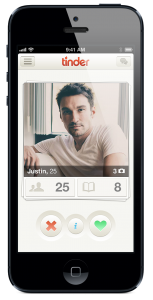 Install Tinder on your tablet or phone. Log in with your Facebook account and Tinder has direct access to your location and photos. After that you can start to look for people. You will see the screen below. In the picture you can see a photo of the person, the name and age. If you are interested in the person you can press the heart but if you don’t want a date press the cross. If you clicked on the heart you should wait until the other person also press the heart of your profile. If he/she does then you get a message from there. when I joined I got two matches in a few days. am I still on the site?